The Gorhi-Terelj National Park covering an area of 2, 864 square kilometers has been enjoying state protection since 1993. The Gorhi Mountains covered with thick woods are rich in wildlife. Fascinating rock formations of Mesozoic era, green meadows covered with edelweiss and dazzling variety of other wildflowers, sparkling waters of mountain rivers are the reason why the locals call this place the museum of natural wealth. Precious stones have been mined here for over 100 years. In 1960, a huge crystal of clear quartz was found at the Gorhi deposit. 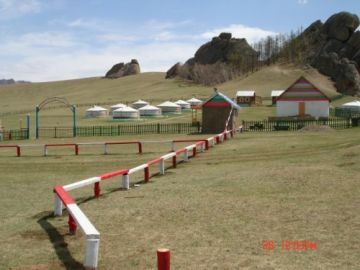 Traditional ger camps are located in the valley of the Terelj River. The memories of this paradise will linger long after your return home. 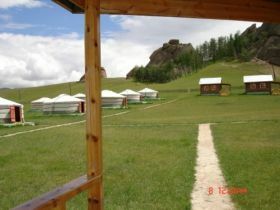 The Khan Khentii Backpackers Camp is conveniently located 55 km east of Ulan Bator. After passing a bridge on the Tuul River nearby the entrance of the Terelj National Park, drive 10 km further and you will see the Khan Khentii signboard. 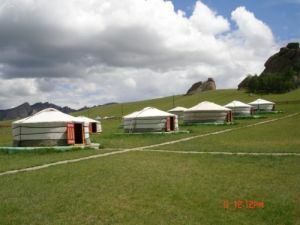 Turn right and drive over 200 m and you are at the Khan Khentii Backpackers Camp. If you travel by public bus, just tell the bus driver Khan Khentii der zogs, which means Please stop at the Khan Khentii Camp. 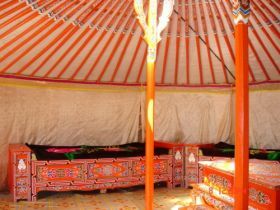 *We can transfer you to/from the Khan Khentii Backpackers Camp by a 4-seat car for only US$10 for the car one way. *The public bus leaves Ulan Bator at the West Crossroad for Terelj National Park.